Track every flight for your organization in a single calendar using the Aviation Status flight schedule tool. View the flight schedule as a month, week or day. 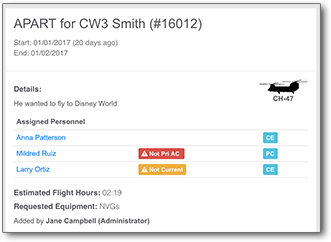 Make changes to the flight schedule easily with the administrative back-end and notify participants as details of flights of change. The Aviation Status flight scheduling tool tracks details about your individual flights. 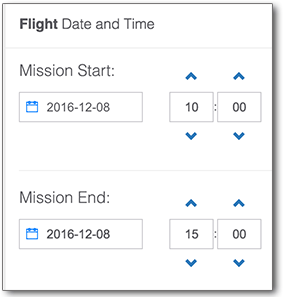 Standard elements like flight title, details and date/time are easily added. The tool also tracks mission number, crew, estimated flight hours, aircraft numbers/type and equipment needed for the particular mission. Because the tool is integrated into CAFRS, ULLSA and the FHP module, aircrew status, equipment readiness and hours are reviewed to provide information to the flight crew that pertains to their flight. For instance, the tool will alert an addition of a crew member whose aircraft listed isn't their primary aircraft in CAFRS. For security reasons, flight data added to the Aviation Status flight schedule is contained locally (within the Title 32 network). But the tool allows for publishing limited data to an organization’s Google calendar on the internet. Once a member subscribes to the Google calendar, they will have published fight mission numbers and date / time of the flight. Coupled with email notifications, the user will be aware for changes in date and time of flights without loosing the operational security of the flight data. Changing data about a flight could not be easier. As a flight operations content provider, the user can adjust all elements of a flight to meet mission requirement changes. As changes are made individual participants of the crew are notified (if specified) of changes by mission number. 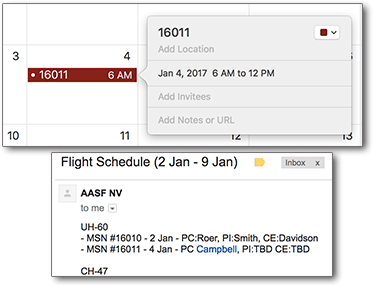 If the flight is published to Google, crew can see the change on their Google calendar subscribed device (computer or mobile). Soldiers will be able to see flights on a organizational Google calendar by mission number. The Aviation Status application was designed with information security in mind without limiting functionality. The use of mission numbers for reference and email notification of additional mission details, provides a two factor constraint. This significantly limits inadvertent disclosure of mission details to wider audiences. Publishing to Google can be toggled on each individual mission and can unpublished from Google at anytime. Aviation Status was Designed, Developed & Tested by Lulius Innovation LLC. Copyrights © 2016 All Rights Reserved by Lulius Innovation LLC.